During the Soviet period the USSR conducted diplomatic relations with incumbent regimes while simultaneously cultivating and manipulating communist movements in those same countries. 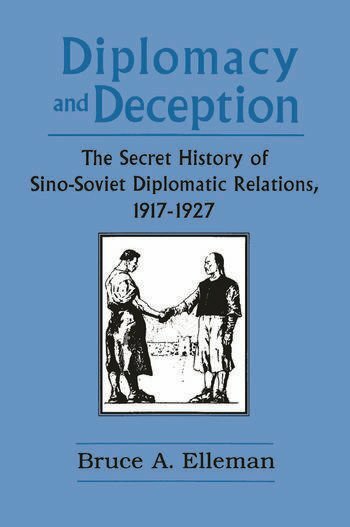 The Chinese case offers a particularly interesting example of this dual policy, for when the Chinese Communists came to power in 1949, their discovery of the nature of Moscow's imperial designs on Chinese territory sowed distrust between the two revolutionary powers and paved the way to the Sino-Soviet split.Drawing on newly available documents from archives in China, Taiwan, Russia, and Japan, this study examines secret agreements signed by Moscow and the Peking government in 1924 and confirmed by a Soviet-Japanese convention in 1925. These agreements essentially allowed the Bolsheviks to reclaim most of tsarist Russia's concessions and privileges in China, including not only Imperial properties but also Outer Mongolia, the Chinese Eastern Railway, the Boxer Indemnity, and the right of extraterritoriality. Each of these topics is analyzed in this volume, and translations of the secret protocols themselves are included in a documentary appendix. Additional chapters discuss Sino-Soviet diplomacy and the parallel history of Soviet relations with the Chinese Communist Party as well as the origins and purpose of the United Front policy. This volume reviews the goals, operation, and history of American antidumping laws coupled with a strategy for using those laws to promote U.S. trade policy and economic objectives in the post-Uruguay Round GATT talks.